Accessible but authoritative, the Walt's People series is the world's best-known, most widely used multi-volume resource about Disney history. In volume 1, Didier Ghez and a dream team of Disney historians, including Jim Korkis, Michael Barrier, JB Kaufman, Robin Allan, Paul F. Anderson, and many others deliver another priceless payload of stories from Disney artists, animators, executives, and Imagineers who worked with Walt Disney, or had key roles in the development of Disney films and theme parks. The interviews and articles in Walt's People represent a treasure trove of research for Disney scholars—but more important, they're entertaining, down-to-earth stories that will please any fan eager to learn more about Disney. You don't need a Ph.D. in Disney Studies to enjoy the recollections and anecdotes from such Disney luminaries as Marc Davis, John Hench, Ken Anderson, Bill Tytla, and over half a dozen others. Marc Davis explains how he immortalized a studio janitor in Pirates of the Caribbean, and the last words Walt spoke to him. John Hench gives the foul details of Salvador Dali's quest for a dead swan while Dali worked for Disney, and the ugly outcome. Bill Tytla reveals the surprising (and very Ukrainian) origin of Mickey Mouse's arch-foe, Chernabog. Ken Anderson talks about the marriage he had to keep secret from Walt—even though his wife worked for Walt, too! Rudolf Ising tells the amusing tale of young Walt Disney's efforts to avoid a debt collector in Kansas City, until finally he couldn't take the guy's mispronounciation of his name any longer. 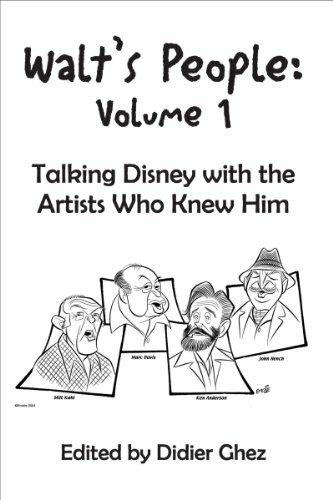 Start prepping for that Disney Ph.D. today with Walt's People: Volume 1!